A new multi-stakeholder collaborative program working to achieve a responsible recruitment marketplace within the US produce industry. The program is designed to equip employers and farm labor contractors with the knowledge, skills and tools they need to operate in a fair and transparent manner and improve the recruitment and employment experience for migrant workers. To stay informed about program news and opportunities to participate click the ‘Register your interest’ button. Informing and equipping migrant worker to know their rights and have access to remediation mechanisms. The Stronger Together US – Responsible Recruitment Program has been funded by the Walmart Foundation. Join one of our multi-stakeholder round-tables, which brings together industry stakeholders to discuss and explore challenges and opportunities within an industry-wide approach to responsible recruitment. Participate in our Stakeholder Forum on Responsible Recruitment to support the promotion of responsible recruitment by building awareness, dialogue, and furthering cooperation among stakeholders, and by contributing to this knowledge hub. 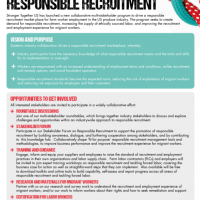 Collaboratively shape ‘fit for purpose’ responsible recruitment management tools and methodologies, to improve business performance and improve the recruitment experience for migrant workers. Engage, inform and equip your suppliers and employees to raise the standard of recruitment and employment practices in their own organizations and labor supply chain. Farm labor contractors (FLCs) and employers will be invited to join expert training workshops on responsible recruitment and tackling forced labor, covering the business case for action as well as straightforward steps that they can implement. Also available will be free to download toolkits and online tools to build capability, self-assess and report progress across all areas of responsible recruitment and tackling forced labor. Partner with us on our research and survey work to understand the recruitment and employment experience of migrant workers, and/or our work to inform workers about their rights and how to seek remediation and support. Support the industry to embed responsible recruitment approaches, including partnering with us to pilot a social labor assurance certification for labor brokers. Download our Stronger Together US Overview Leaflet for more information. Contact us to register your interest in the program and receive program newsletters. Read the latest program news to find out more about the programme and how you can get involved. Check out our upcoming workshops and learning opportunities. A pioneering, fully-interactive, practical online toolkit that equips labor providers,labor recruiters, and in-house recruitment and HR teams to recruit responsibly, enabling them to achieve business goals while delivering exceptional jobseeker and worker experience. To be launched in the US produce industry as part of the program. A global social compliance scheme for labor recruiters and providers whose objective is to drive responsible recruitment practice in supply chains.